Since there are only two (well, four, but only two of us really eat) here we tend to have a lot of leftovers. Especially if I make a big meal like a boiled dinner, or roast chicken. 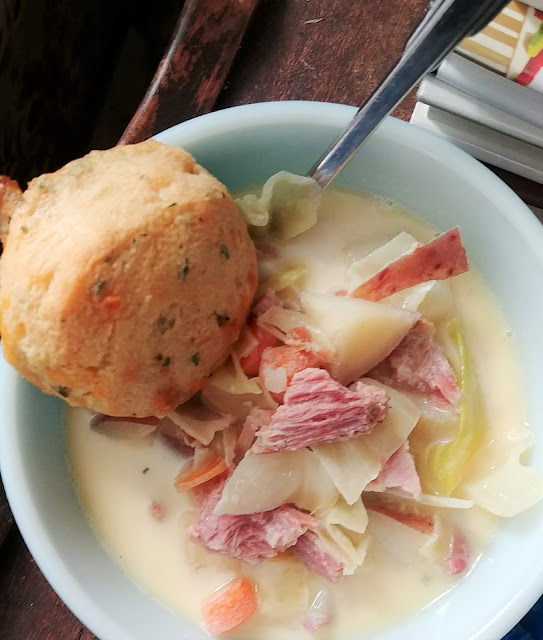 This year we took our leftover corned beef and cabbage and turned it into a yummy chowder. In fact, it turned out so well I thought I'd share the recipe here, in case you are in the same boat as us and have a big pot of leftovers. Potatoes-boiled and diced into bite sized pieces. Cabbage-boiled and chopped into one inch squares (roughly). Butter, milk, and salt and pepper. Saute the onion in melted butter until onions are translucent. Add all other ingredients and heat slowly. Add about a tablespoon of butter and season to taste with salt and pepper. Serve hot with biscuits or rolls. AMOUNTS. This is all up to you. I used about one medium onion for a 6-8 cup pot of chowder. The milk was about 2 inches over the top of all the meat and veggies. I used about 1 cup each of corn, meat, carrots, and cabbage. And about 2 cups of potatoes.